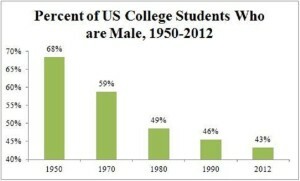 This selection comes to us from a Forbes article by the venerable Richard Vedder titled “The Disappearing Male on College Campuses.” Today’s chart shows that there has been a consistent, downward trend of male participation in college for several decades now. As professor Vedder points out, this is both a function of declining male enrollments on the front end and a lopsided tendency to drop out early on the back end. While the policy wonks and sociologists worry about the causes (though I certainly have my own theories), affordologists must contend with the effects. Today let’s not get caught up in the big picture of “why is this happening?” or “what should we do about this?” (political) but “why should I care?” and “what should I do about this?” (practical). Whatever the reasons, this does indicate the existence of a certain set of problems. Just as with dismal dropout rates in general, men need to let this serve as a wake up call and entertain college decisions with a higher degree of alertness. If men have a harder time on campus in general, then it becomes all the more pertinent to pay attention to what makes for a successful experience. College struggles, whether it leads to taking longer or dropping out, tend to needlessly cost money. Therefore take heed from those who have experienced college success. Perhaps most importantly recognize that every cloud has a silver lining; every crisis presents opportunities for the opportunistic. This under-representation of men in higher education certainly does have its positive implications for those who can strategically buck the trend. As for point #3, stay tuned. We’ll explore ways to take financial advantage of campus under-representation, whatever the flavor of it, in our next Tip of the Week.